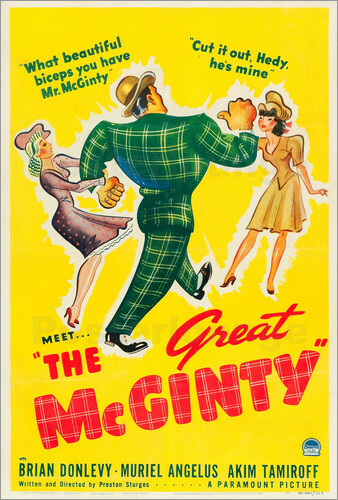 The Great McGinty (1940) is the movie that began Preston Sturges’s writer/director career. Supposedly Sturges sold his script to Paramount for $10 in a deal so he could direct his first film. The Great McGinty won an Academy Award for Best Original Screenplay and stars Brian Donlevy as a tramp who rises to political power with the help of a corrupt political boss (Akim Tamiroff). The cast also includes Muriel Angelus, Allyn Joslyn, Thurston Hall, and Sturges stock company player, William Demarest. The suits at Paramount gave Sturges a B-picture budget of $350,000 and a three-week shooting schedule, as well as cheap talent under contract to the studio. Donlevy, a staple in films for almost a decade, was perfect for the role of McGinty, a man who goes from bum to city mayor and then state governor. It’s a wild ride, along with boss Tamiroff, who plans every step of McGinty’s political career. Eventually, the corruption and deal making catches up with both The Boss and McGinty. Will they both go down for the count? The Great McGinty was a hit when it premiered on August 15, 1940 in New York City. Popular with both moviegoers and film critics, it was named on of the 10 best films of 1940 by the New York Times. For a preview of the film, check out the clip below. Could McGinty be from Chicago?